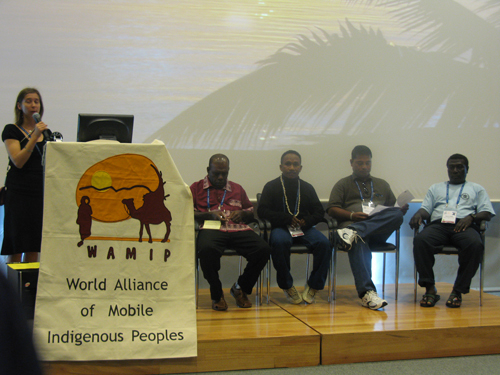 The first session of the day was entitled “Mobile Indigenous Peoples Governing the Landscape”, presented by the African Studies Center and was an Alliance Workshop involving the mobile indigenous peoples affiliated with the World Alliance of Mobile Indigenous Peoples (WAMIP). The workshop was intended to showcase the customary institutions through which indigenous groups have governed and conserved their landscapes for generations. The second session of the day was a peer-to-peer exchange on marine biodiversity. The first community group to present was the Arnavon Community Marine Conservation Area Management Committee (ACMCA). The group presented on some of the obstacles to their work (including imprisonment), the way the conflict over ownership of the area was solved, and the collaborative work with scientists to monitor the health of the surrounding ecosystems. The second community to present was the Conservation Society of Pohnpei (CSP). The group presented on its integrated watershed programme, the challenges of integrating new communities and new marine protected areas, their efforts to protect local mangroves (the largest mangrove protection area in the pacific), and the challenge of deforestation. The third group to present was the Indonesian Community-based Marine Management Foundation (PLKL). The group showed a video illustrating their work, talked about establishing “no fishing” zones in strategic areas, adoption by the community of new rules, mapping exercises, and the cultural significance of sasi to local groups on keeping binding regulations. The final presentation was given by Kalpat Tarip was the Nguna-Pele Marine Protected Area (NPMPA) from Vanuatu. The group presented on its work doing sea turtle tagging, eco-tourism promotion, community workshops, awareness raising in primary schools, and the challenges of livelihood security, training and equipment, and enforcement. The group also reviewed accomplishments that included expansion to 10 new villages. The next session was the Local-Global Leaders Dialogue. Global panelists included: Mark Tercek, CEO of The Nature Conservancy; Brett Jenks, President CEO, Rare Conservation; Veerle Vandeweerd, Director Environment and Energy Group, UNDP; Erica Harms, Executive Director of the United Nations Foundation; Jennifer Morris, Vice President of the Global Conservation Fund, Verde Ventures, Conservation International; Glenn Pricket, Senior Vice President for Conservation International; Lori Buck, Director, Landscape Measures Program for Ecoagricultural Partners; and Tone Solhaugh, Senior Advisor for the Ministry of Environment, Norway. Local panelists included: David Kuria, Team Leader, Kijabe Environment Volunteers (KENVO); Alex Limaco, Chalalan Eco-lodge; and Patterson Shed, Executive Director, Conservation Society of Pohnpei. Following an opening and greeting from Benson Venegas, who acted as facilitator for the event, the panelists introduced themselves and provided some context for their participation in the dialogue. Panelists mentioned: a willingness and desire to learn; the importance of communities in their respective work; the need to develop a range of local knowledge sharing tools; the perspective that it should be a community panel with an international policy-makers audience; and the concentration of local groups in buffer zones and the need to provide them with viable income-generation options. focus on local markets rather than on international ones, to better understand and monitor the ebb and flow of changes in the market. It was also suggested that communities stay connected with one another, with the Equator Initiative, and that they could act as centers of excellence when they return home. Panelists concluded with a call to communities to continue communicating and learning from one another. The panelists were appreciative of the opportunity to speak with local groups and were left with much to consider and many lessons. The general hope was for an amplification and multiplication of local successes as well as a branding of communities as the solution to the global environmental crisis. The session closed with a thank you from the communities and a desire to move forward together with international partners. The next session, entitled “A Common Agenda Between Indigenous Peoples and Conservation” was hosted by Conservation International. The link between the loss of forests and the loss of indigenous peoples, languages, and cultures was noted at the outset. A presentation was given by Egberto Tabo, Coordinator General of COICA. The vision of the group is to coordinate efforts and ideals of all peoples in the Amazon basin and to generate policies and actions at the local and national levels for the sustainable development of the Amazon region. A point was made by one of the participants that indigenous groups are not always poor – they are, in fact very rich in knowledge but poor in resources because outsiders take their land and infringe on their rights. 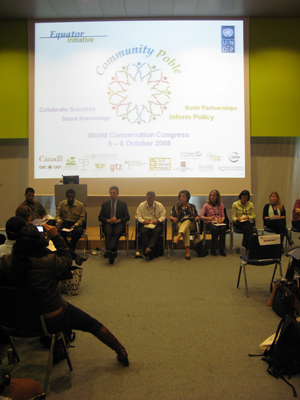 The following session was on peer-to-peer knowledge exchange on indigenous and community conserved areas (ICCAs). The first presentation was from representatives of the N≠a Jaqna Conservancy from Namibia. The next presentation was from Corporación Serraniagua from Colombia. The group discussed how it was working to overcome social problems in the area, and how sometimes social agencies can hinder progress. They also discussed how public-private partnerships have been a large part of their strategy. The following community to present was the Wechiau Community Hippo Sanctuary from Ghana. The group presented on some of its successes, including: an increase in tourism, an increase in local revenues, the installation of 13 boreholes, stabilization of hippo numbers, and the introduction of new species to the region. The third community to present was the Sri Lanka Wildlife Conservation Organization. The group presented on several challenges, including: the difficulty of working together with people of different backgrounds, the unwillingness of some to learn and adapt to a change in lifestyle, the lack of process to enforce and issue penalties, and the lack of a legal and administrative framework. The final group to present was Unión de Organizaciones Campesinas e Indígenas de Cotacachi (UNORCAC) from Ecuador. The group presented mainly on the number of people involved and the gender component of their work. The final session of the day was entitled “Maori Community Goals for Enhancing Ecosystem Health” and was presented by He Oranga Trust. The workshop presented a case study of community driven and community controlled collaborative research between an indigenous community and a government science/ research institute. It also explored the effective combination of traditional knowledge and scientific methodologies to advance community sustainable development programmes. 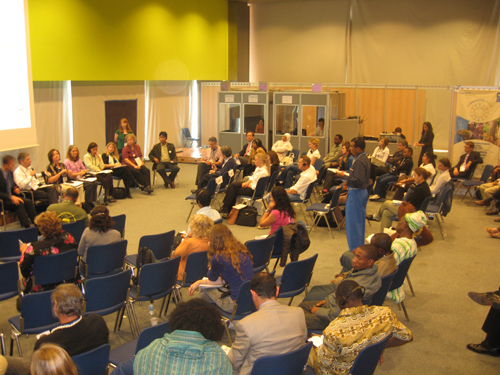 The session focused on water, biocultural diversity, and indigenous people.